A revenue department worker in Bangkok said that she went to the cops after a man molested her on the back seat of a minivan. But despite having SEVEN previous offences for molestation the man was just let go. The reason was that the assault was "not out in the open". The woman was also told to go to another police station where the assault happened. Furious that nothing was being done she has now contacted the Paveena Honksakul Foundation and an arrest warrant has been issued. 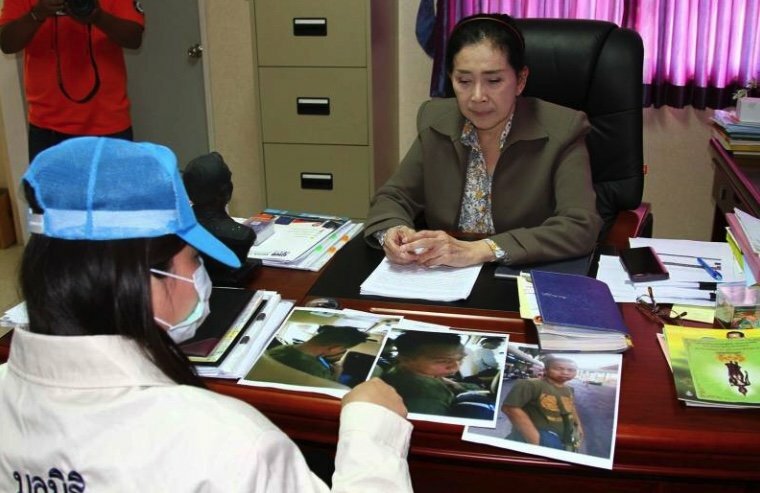 Daily News reported that the lady was travelling to work from her home in Wang Noi, Ayuthaya to Future Park in Rangsit north of Bangkok on March 6th. She had sat down on the back row of the Lopburi to Bangkok service and fallen asleep with her bag on her lap. She awoke and the man next to her had his hand between her legs. She screamed and a woman on a seat in front said she had been similarly assaulted but had said nothing. The man tried to get off and the driver said they would sort it out with the police at Rangsit. The actual assault had happened while the van was passing through Klong Luang. Fellow passengers helped restrain the suspect. The victim meanwhile called the cops too. At Rangsit the cops met the van and the victim and her assailant went to the Pratunam Chulalongkorn police station where he admitted what he did. However, the victim said that she was told to go to Klong Luang police to report it. The man - Suradech Daengnoi, 44, from Yasothon had seven previous offences for molestation to his name and a theft charge. The victim was astounded when he was simply let go as the cops said it was not an overt attack. She went to Klong Luang but when nothing happened after two days she decided to seek help with the Paveena Hongsakul Foundation that helps women and children in such matters. Now it has been confirmed that an arrest warrant is out for the Yasothon man from the Thanyaburi court. It was dated 14th March. Should have issued one for the copper that let the dirty pervert walk free too ! The reason was that the assault was "not out in the open". they just don't want to do anything. How many times does he have to assault someone before he is locked up? ...depends on how many friends in high places he got. One of the things about police here is a little strange. You have to go to a police station that's covers the area where an event happens. When I had a theft on a bus years back that passed areas under control of 3 of them they all refused to even write a report because I could not be sure it happened in exactly their jurisdiction. That was a 2 km and 10 minutes. Obviously I didn't realise until I got off. Are they just lazy, or want their safety numbers look good on them? These cops have their hands between their legs constantly so they think its normal. Maybe they should be arresting people and letting the court decide guilt like the rest of the world. The notion of police determining guilt and setting penalties is a joke. One more and the perv gets a set of steak knives.